I wouldn’t say this lightly, it’s definitely one of the best soup dishes to be cooked as a treat to yourself as well as your family. 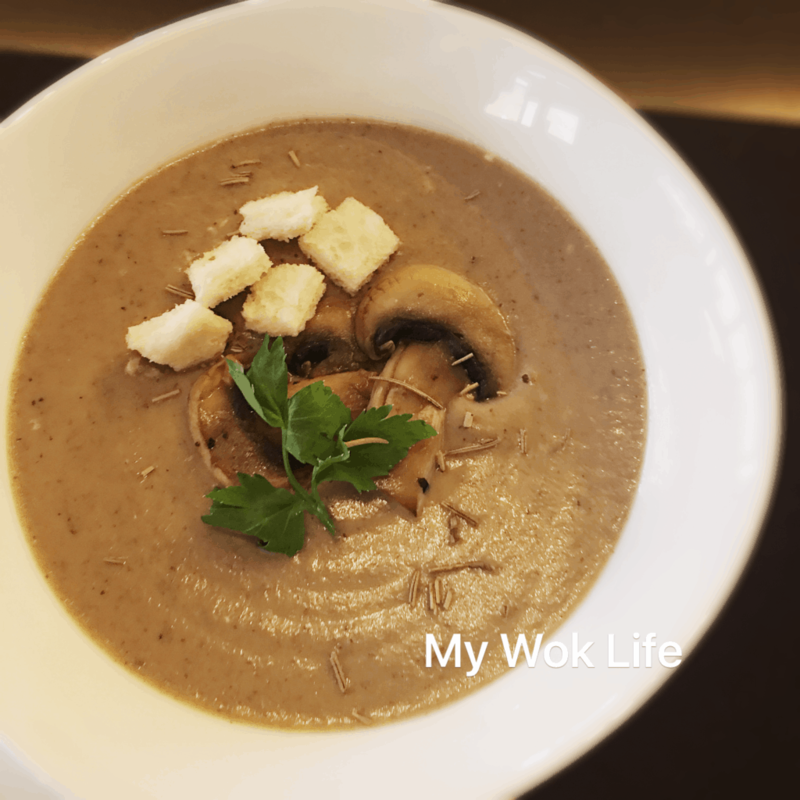 Nothing complicated, I chose 3 types of the common mushrooms, and the combination really yields an extensive flavor, with the right & smooth creamy consistency. Everyone, small to big, just loves it! (1) Sauté Shiitake mushrooms on dry heated pan, medium high fire. Stir occasionally to avoid burnt. The browning of mushrooms is considered done only when the water emitted from the mushrooms has dissipated and aroma releases fully. Dish up. (3) Using the same pan, add butter and onion, sauté till soft and browned. Add garlic, and return all the browned mushrooms. Stir to combine. Pour in chicken stock and water. Reduce heat to low and let it simmer for 30 minutes. Heat off. (4) Pour mushroom broth into blender jar, add salt and pepper. Blend until smooth. Transfer mushroom soup to a pot on low heat. Stir in cooking cream (in one direction) until smooth and creamy consistency. Heat off. (5) Make crouton: Remove crust of all sides. Cut thick bread into cubes. Bake/ air fry at 120deg Celsius for 6-8 minutes, or until crisped. 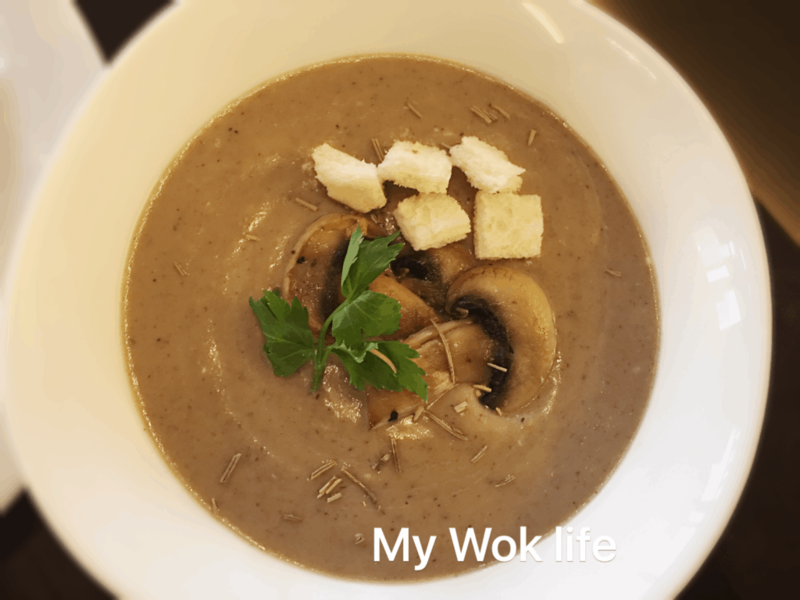 Divide cream of mushroom soup into bowls, garnish and top with mushroom slices and crouton. Serve hot. 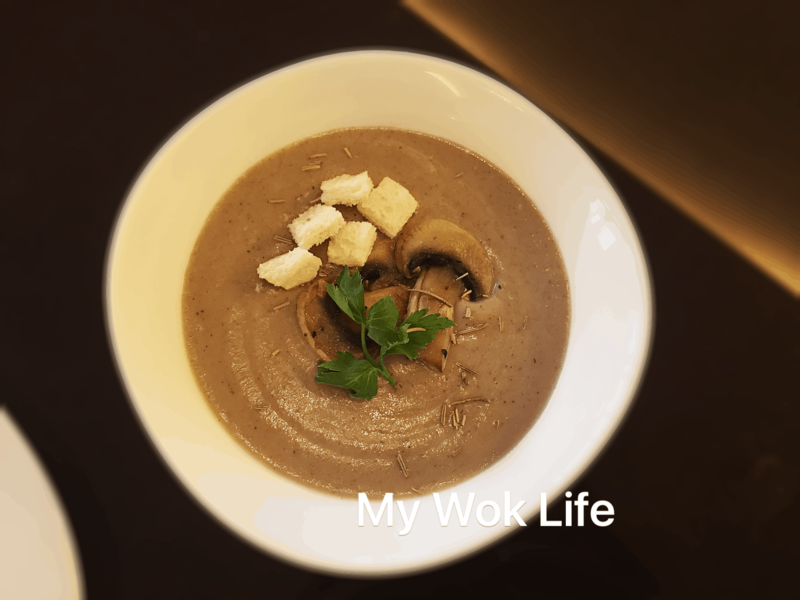 A serving of my cream of mushroom counts 170kcal. Tips: For more intense flavor, use more chicken stock and less amount of water, as long as the total amount of liquid to be added come up to about 550 – 600g. In the case of increased chicken stock is used, salt may be reduced or omitted at all. Do a taste check before adding the salt. * May add 10g sour cream into the cooking. I like it sometimes which may lighten up the aftertaste. * It is necessary to sauté the mushrooms in batches as you do not want to over crowd the pan. Over crowd the pan will make the browning a lot harder. * Italian herbs in bottle is available at major supermarkets. Spices shelves. Any brand. May opt for freshly chopped herbs, too. Thymes are great in this.